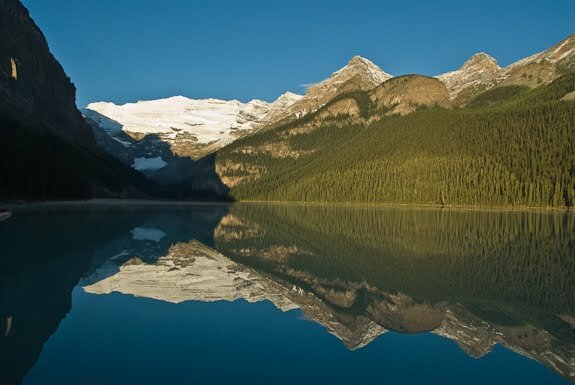 The Traveling Tripod: Lake Louise - Alberta photo-feature with slide show. 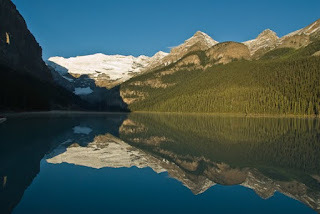 Lake Louise - Alberta photo-feature with slide show. All my life, I loved looking at magazines articles with photos of the Pacific Northwest. I knew I needed to follow in my great-grandfather's footsteps and head north to capture the beauty photographically. The quintessential photo of the area for me was always that image looking into Lake Louise from the Fairmont Chateau Lake Louise. I just had to see it for myself. After years of dreaming, August was set as the date to make the trip. Flying into Calgary, we rented a car and headed west to Banff National Park. Banff is in fact, the birthplace of Canada's park system. In 1885 the park was founded and over four million visitors a year now trek north to enjoy this most pristine place. Arriving in Lake Louise, we wound our way up to the lake. Checking in to our hostel could wait - I needed to finally see the lake. Pulling into the parking lot, it all became so familiar. All those photographs I had admired came back like deja vu. It was exciting and new; but, familiar and old at the same time. With the smell of the lodgepole pines and a cool breeze coming from the glacial waters, we quickly donned our fleece vests and made our way to the water's edge. To the left of the lake, Mount Fairview rises 2,745 meters almost straight up with a rugged rock face. Straight ahead, we viewed the Upper and Lower Victoria Glaciers, each unique but both perfectly centered and reflecting in the water at the end of the lake. The white of the glaciers contrasted nicely against the dark rock faces to the left. To complete the story and see the slide show, click here.